How to Create an Analytic View? 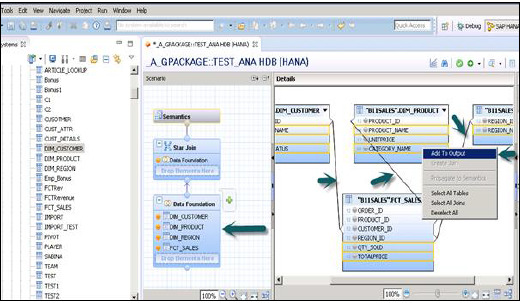 Choose the Package name under which you want to create an Analytic View. Right Click on Package → Go to New → Analytic View. When you click on an Analytic View, New Window will open. Enter View name and Description and from drop down list choose View Type and Finish. When you click Finish, you can see an Analytic View with Data Foundation and Star Join option. Click on Data Foundation to add Dimension and Fact tables. Click on Star Join to add Attribute Views. Add Dim and Fact tables to Data Foundation using “+” sign. In the example given below, 3 dim tables have been added: DIM_CUSTOMER, DIM_PRODUCT, DIM_REGION and 1 Fact table FCT_SALES to Details Pane. Joining Dim table to Fact table using Primary Keys stored in Fact table. Select Attributes from Dim and Fact table to add to Output pane as shown in snapshot shown above. Now change the data type of Facts, from fact table to measures. 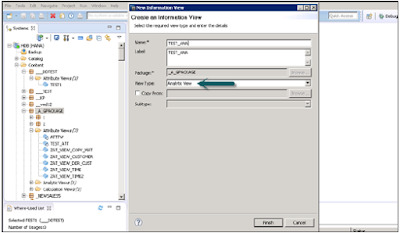 Click on Semantic layer, choose facts and click on measures sign as shown below to change datatype to measures and Activate the View. 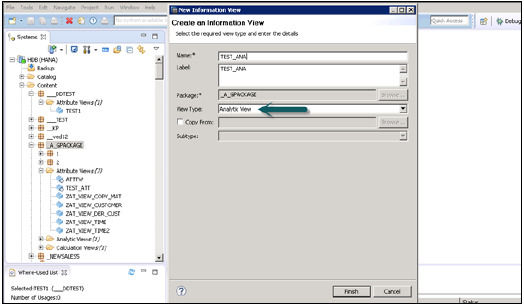 Once you activate view and click on Data Preview, all attributes and measures will be added under the list of Available objects. Add Attributes to Labels Axis and Measure to Value axis for analysis purpose. There is an option to choose different types of chart and graphs.